I would have never thought we would have gotten so many emails for a Windows 98 DST Patch. If you missed it, we have created an unofficial patch for Windows 2000 that updates it to the new Daylight Saving Time enacted here in the United States. Microsoft is not providing one since Windows 2000 is no longer supported. They also shortened the name of the time zones, in Win9x, so “Central Standard Time” is only “Central”. Daylight saving time is simply broken in Windows 95, so I wouldn’t even bother trying to apply the patch to these systems. Will there be any further updates for the Windows 98 DST patch similar to the Windows 2000 DST patch? 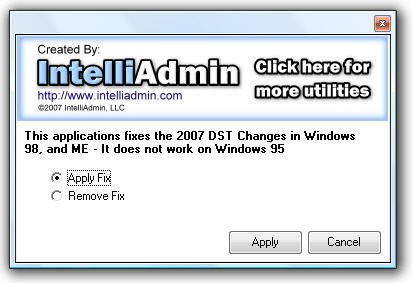 I noticed that Microsoft has released another DST patch for Windows XP again. No. We are no longer updating the 98 DST patch. Lack of compiler tools that fit into our dev chain is the biggest reason why.